We have been offering marine condition monitoring services for over forty years. During this time we have perfected predictive maintenance vibration systems which are class approved. 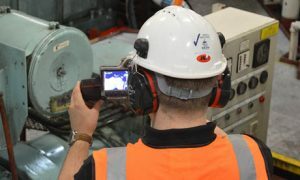 We also lead the way in troubleshooting, using Condition Based Maintenance techniques including noise, vibration, thermal imaging, ultrasound and tribology. Our expertise include high-speed in-position dynamic balancing and laser alignment of engines, fans, motors, centrifuges, pumps and any rotating or reciprocating machinery. With VCI’s predictive maintenance solutions you will always be aware of a machine’s condition. The risk of catastrophic failure is significantly reduced and you can say goodbye to unnecessary dismantling of machinery for routine maintenance checks. VCI have found that new plants and vessels can experience problems with installed machines, together with structural vibration issues. Unless these problems are identified and corrected, premature machine failure will be experienced thereby incurring higher maintenance costs. This survey allows considerable reduction in cost by avoiding opening healthy machines for refurbishment, concentrating resources on those which require repair. These multi-tech surveys are undertaken up to three months before the planned shutdown where our consultant visits the site, surveys the machinery, identifies machines which are satisfactory and those with problems. VCI provide oil analysis services which is a well proven technique for monitoring inaccessible components in equipment that is being operated dynamically. Its strength lies in its ability to identify faults and potential failures at an early stage. VCI Consultancy Ltd is an approved External Specialist in condition monitoring by major Classification Societies. VCI are an Accredited Training Organisation (ATO) through The British Institute of Non-Destructive Testing (BINDT) for training in accordance with the internationally recognised ISO 18436-2 categories 1 & 2. We are also accredited through BINDT for MMCM training for marine clients. Alternatively, training can be tailored to the client’s requirements and held at the client’s offices or any suitable location. VCI can provide remote analysis services for vibration data collected by vessel/plant staff using portable or fixed data collectors.